Read below, a very thorough article on activity happening in Arizona as Gov. Brewer considers SB 1070. As of Monday, the Governor’s Office had received 1,356 calls, e-mails and faxes in favor of SB 1070 and 11,931 against the bill. This week, the Arizona state legislature approved troubling legislation which will soon be up to Arizona Governor Jan Brewer to approve or veto. If signed into law, the bill, “Support Our Law Enforcement and Safe Neighborhood,” SB 1070, would greatly expand the role of local law enforcement by requiring state and local police officers to determine the immigration status of anyone suspected to be in the country unlawfully. It would also leave drivers open to sanctions for knowingly transporting an undocumented immigrant, even if the person is a relative or friend. LIRS is deeply concerned about bill’s impact on Arizona families and communities. It would create a culture of fear among immigrants and their families of law enforcement and would undermine community safety. If people are afraid that their families, neighbors and friends will be rounded up, they may hesitate to share information to the police about crimes taking place in their community. Furthermore, it would make it harder for police officers to do their jobs, and would make it easier for criminals to do theirs. Call Governor Brewer’s office at (602) 524-4331 and tell her to veto SB 1070. Let us know how your call went! Join Governor Brewer’s Facebook page and leave a comment on her wall in opposition of SB 1070. Click here to send an on-line message to Governor Brewer or your own governor as well as other elected officials. Tell them that you stand for welcome, and that instead of dividing communities, we should focus on reforming our nation’s immigration laws. Words of Welcome: New LIRS eNewsletter! 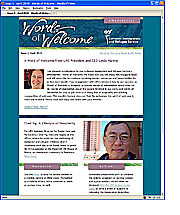 Posted in Uncategorized | Comments Off on Words of Welcome: New LIRS eNewsletter! While sitting at the Lutheran Immigration and Refugee Service booth on the last morning of Ecumenical Advocacy Days in Washington DC (EAD) I had the pleasure of meeting The Rev. Chris Mietlowski of Gustavus Adolphus Lutheran Church in New York City. His connection with immigration advocacy was evident and strong, as he is personally involved in the lives of newcomers within his congregation. Pastor Mietlowski is a friend of LIRS, and his church building provides space for the office of an LIRS field coordinator. The week after EAD, as I was writing an article about the event, I sent an email to Pastor Mietlowski asking him to comment on the weekend’s activities. In return I received absolutely beautiful comments about the EAD gathering on migration. Without further ado, I would love to share it with you. “My name is Rev. Chris Mietlowski, pastor of Gustavus Adolphus Lutheran Church, an historic congregation in the heart of Manhattan. This parish began in 1865 by Swedish Immigrants and has developed into one of the most diverse congregations in the ELCA. I was invited to attend the Ecumenical Advocacy Days Conference in Washington, DC on March 19-22 by our Bishop, Robert Rimbo. We have been deeply involved with a church family embroiled in a potential deportation situation. The congregation has rallied to provide prayer and financial support. We have signed petitions, written letters and made calls to our state senators. We have helped with rent, food and legal representation. We also held a prayer service for this family. A few of us visited with the family member who was arrested and held in the detention center in Elizabeth, New Jersey. He was suddenly released about 2 months later, much to the surprise of his attorney, family and the congregation. His appeal is pending. We know other families living with the potential of being torn apart at any moment. The conference turned out to be one of the most remarkable conferences I had ever attended. It was inspirational, well organized and provided a tremendous amount of useable information on immigration reform. All the speakers were dynamic. Some were trained communication experts/immigration advocates helping the conference attendees be better prepared in meeting with elected officials. Other speakers told stories of their own lives or those they serve who have suffered terribly because of a broken immigration system in the U.S. A tremendous spirit of cooperation and unity bound conference participants who truly expressed a holy compassion for the voiceless undocumented who live unsettled each day. I provided copies of all the materials to the Bishop and his chief of staff. As I got home for the day and began tearing apart my room in search of my license, I was soon disappointed that I couldn’t find it anywhere. As days passed I continued searching every pocket, backpack, purse, and drawer in my life. Eventually I came to terms with the fact that my driver’s license would be gone forever until I could figure out how to get a new one. This posed a problem, per-usual, as confusion is always caused when inquiry of my “permanent address” or “hometown” is found on any important document. You see, I grew up and attended college in Washington State, but two years ago my parents moved to Nebraska. Now I am in Baltimore, MD for the year, planning to return to Seattle, Washington or Berkeley, California, but still dependent on parents living in Nebraska. No family ties in Washington, no personal ties (besides my beautiful parents) to the state of Nebraska, and a strictly one-year window of time to live in Baltimore City. Where should my new drivers license come from?! As I called my mom to discuss the retrieval of a new license, she began asking me about my documents: did I have a copy of my birth certificate? No. How about my social security card? Nope. My soul piece of identification had become my passport. This caused another small dilemma, as we soon discovered the reality that most frequently in this country you need documents to get documents. We decided that I would make an attempt to get my Nebraska license renewed from a remote location. So, I began to research. With assistance from my parents I found the appropriate paper work, filled it out, and sent it in. Two weeks later I received a package from the Nebraska Department of Licensing. As I excitedly opened the envelope, hoping for the license-getting-process to be quick, easy, and over, I became quickly dismayed as I looked to see that my form had been sent back. Apparently there had been errors on it. Thus began the long and lengthy process of my mother requesting copies of my birth certificate so she could get me a temporary driver’s license sent to her home in Nebraska, to then be forwarded onto me in Baltimore. Three months later I finally had a new driver’s license. Following the license came a copy of my birth certificate as well as my social security card. As an American-born english speaker this process was frustrating, tiring, and confusing. As I went through the process of obtaining my documents I kept thinking and wondering about what this must be like for a newcomer to the United States, to be unfamiliar with the culture, customs, and language. For housing, work, and safety to depend upon having these strange documents that seem so unobtainable. This anecdote is a very small piece of the frustration and anxiety so many refugee, immigrant, and asylum-seeking people have trying to navigate an overly confusing and difficult system of paperwork and protocol, frequently in an unknown language. Without the help, support, and assistance from my family members, I probably would still not have these identifying documents. In my case, it took about three months to obtain all of my paperwork. Many do not have three months to wait and consistently the process will take much longer. As I think about welcome in the United States I consider acts as simple as helping others to obtain the correct paper work, or translating paper work so that things make a little more sense. There are many simple things that we can do to for others to make lengthy and exhausting processes seem a little less difficult. Click here for some ideas from LIRS.